I love Japanese sweet potatoes! Grilled, boiled, nuked, baked, fried- it doesn’t matter. 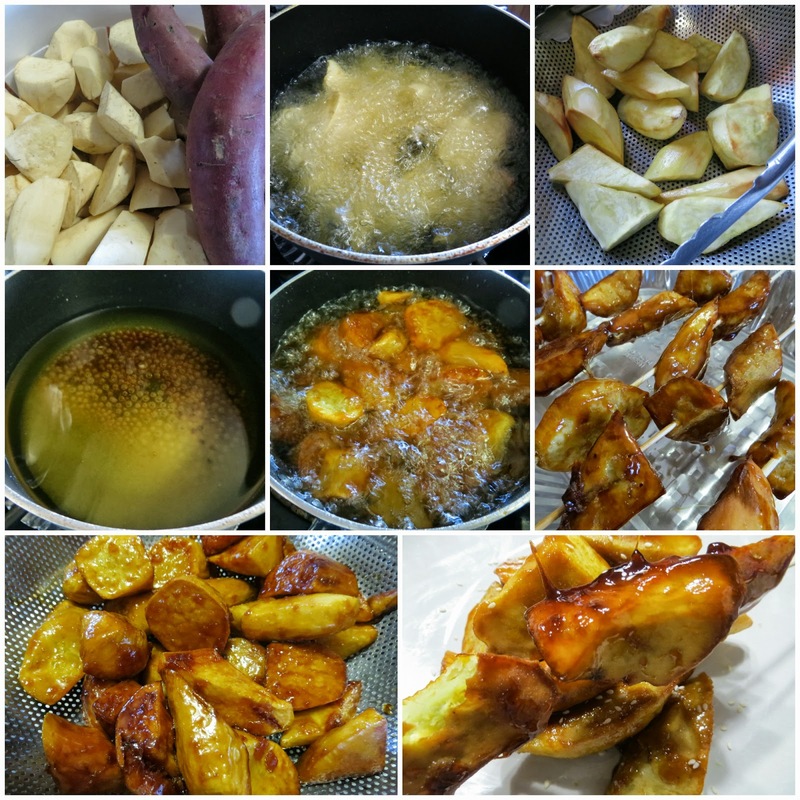 It has that texture and sweetness that separates it from other potatoes or yams and I think it’s because it has less water content than the rest. That explains too why they’re more expensive than the regular American yam. The purple yam which is also pricey and has the same texture ranks the same in my book by the way. There's a classic Japanese treat called Daigaku Imu where the sweet potatoes are cut into bite-size pieces, deep-fried and then smothered in caramel made from simple syrup and soy sauce then sprinkled with black sesame seeds. That is something really unique but it really works and I love it too. But for now, I decided to take the simple but definitely delicious route to this treat. The best way to get that crunchy on the outside and soft on the inside texture is by deep frying. So I do it in batches and in the same oil (while the sweet potatoes are draining off excess oil in a colander) I add granulated white sugar and just let it melt. When it turns amber, it's time to put back the potatoes and just toss them gently to coat. This is kind of tricky because the right temperature must be maintained- too hot and the caramel starts to burn; not hot enough and it takes forever for the sugar to caramelize. After each piece is coated, I transfer them to a colander to drain excess oil- better yet, they all do into bamboo skewers to prevent sticking. That is the Filipino way and it does make sense. But if you're ready to snack on it- just pile them on a plate, sprinkle toasted sesame seeds and use a fork or chopsticks as your weapon of utter satisfaction! I normally use light brown sugar for this treat but I realized that white is even better. It will turn golden anyway and the result is brittle, thin coating that stays crunchy for hours if you leave them in skewers.